Most crime movies begin in the present and move forward, but film noir coils back into the past. The noir hero is doomed before the story begins -- by fate, rotten luck, or his own flawed character. Crime movies sometimes show good men who go bad. The noir hero is never good, just kidding himself, living in ignorance of his dark side until events demonstrate it to him. 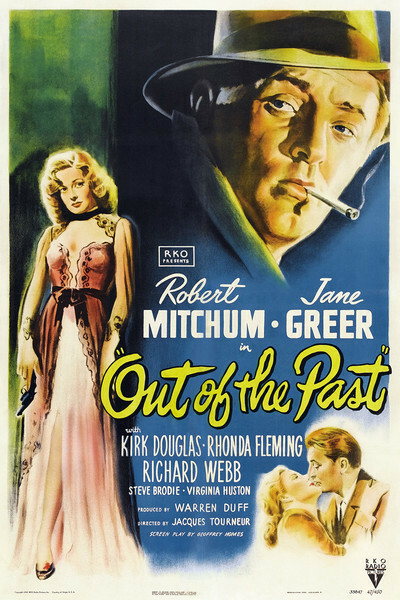 "Out of the Past" (1947) is one of the greatest of all film noirs, the story of a man who tries to break with his past and his weakness and start over again in a town, with a new job and a new girl. The movie stars Robert Mitchum, whose weary eyes and laconic voice, whose very presence as a violent man wrapped in indifference, made him an archetypal noir actor. The story opens before we've even seen him, as trouble comes to town looking for him. A man from his past has seen him pumping gas, and now his old life reaches out and pulls him back. Mitchum plays Jeff Bailey, whose name was Jeff Markham when he was working as a private eye out of New York. In those days he was hired by a gangster named Whit Sterling (Kirk Douglas, electrifying in an early role) to track down a woman named Kathie Moffat (Jane Greer, irresistibly mixing sexiness and treachery). Kathie shot Sterling four times, hitting him once, and supposedly left with $40,000 of his money. Sterling wants Jeff to bring her back. It's not, he says, that he wants revenge: "I just want her back. When you see her, you'll understand better." That whole story, and a lot more, is told in a flashback. When we meet Jeff at the beginning of the film, it's in an idyllic setting by a lake in the Sierras, where he has his arm around the woman he loves, Ann (Virginia Huston). He bends over to kiss her when they're interrupted by Jimmy (Dickie Moore), the deaf and mute kid who works for him at the station. Jimmy uses sign language to say a stranger is at the station, asking for him. This man is Sterling's hired gun, named Joe Stephanos (Paul Valentine), and he tells Jeff that Sterling wants to see him in his lodge on Lake Tahoe. Jeff takes Ann along on the all-night drive to Tahoe, using the trip to tell her his story -- his real name, his real past, how he tracked Kathie Moffat to Mexico and fell in love with her. ("And then I saw her, coming out of the sun, and I knew why Whit didn't care about that 40 grand.") He tells Ann more, too: How he lied to Sterling about finding Kathie, how he and Kathie slipped away to San Francisco and thought they could live free of the past, how they were spotted by Fisher (Steve Brodie), Jeff's former partner. Fisher followed them to a remote cabin, where Kathie shot him dead, leaving Jeff behind with the body and a bank book revealing she indeed had stolen the $40,000. The story takes Jeff all night to tell, and lasts 40 minutes into the film. Then we're back in the present again, at the gates of Sterling's lodge. Ann drives away and Jeff walks up the drive to square with his past. In the lodge, not really to his surprise, he finds that Kathie is once again with Sterling. This Sterling is a piece of work. Not only has he taken Kathie back after she shot him, he wants to hire Jeff again after he betrayed him. This time he needs him to deal with Leonard Eels, an accountant in San Francisco who keeps Sterling's books, and is blackmailing him with threats involving the IRS. The meeting between Mitchum and Douglas opens on a note of humor so quiet, it may pass unnoticed. "Cigarette?" offers Douglas. "Smoking," said Mitchum, holding up his hand with a cigarette in it. Something about that moment has always struck me as odd, as somehow outside the movie, and I asked Mitchum about it after a screening of "Out of the Past" at the Virginia Film Festival. "Did you guys have any idea of doing a running gag involving cigarette smoking?" I asked him. "Because there's more cigarette smoking in this movie than in any other movie I've ever seen." "We never thought about it. We just smoked. And I'm not impressed by that because I don't, honest to God, know that I've ever actually seen the film." "I'm sure I have, but it's been so long that I don't know." That was Mitchum for you, a superb actor who affected a weary indifference to his work. There is a lot of smoking in "Out of the Past." There is a lot of smoking in all noirs, even the modern ones, because it goes with the territory. Good health, for noir characters, starts with not getting killed. But few movies use smoking as well as this one; in their scenes together, it would be fair to say that Mitchum and Douglas smokeateach other, in a sublimated form of fencing. The director is Jacques Tourneur, a master of dark drama at RKO, also famous for "Cat People" (1942) and "I Walked with a Zombie" (1943). He is working here for the third time with the cinematographer Nicholas Musuraca, a master of shadow but also of light, and Musuraca throws light into the empty space between the two actors, so that when they exhale, the smoke is visible as bright white clouds. Mitchum and Douglas think the story involves a contest of wills between them, when in fact, they're both the instruments of corrupt women. Kathie betrays both men more than once, and there is also Meta Carson (Rhonda Fleming), the sultry "secretary" of Eels the accountant. What's fascinating is the way Jeff, the Mitchum character, goes ahead, despite knowing what's being done to him. How he gets involved once again with Sterling and Kathie, despite all their history together, and how he agrees when Meta suggests a meeting with Eels, even though he knowsand even says"I think I'm in a frame," and points out that he's been given a drink so that his prints will be on the glass. The scenes in San Francisco, involving the murder of Eels, the whereabouts of the tax records and the double-dealing of Meta Carson, are so labyrinthine, it's remarkable even the characters can figure out who is being double-crossed, and why. The details don't matter. What matters is the way that Jeff, a street-wise tough guy, gets involved in the face of all common sense, senses a trap, thinks he can walk through it, and isstillfascinated by Kathie Moffat. He first reveals his obsession in Mexico, when Kathie claims she didn't take the 40 grand. "But I didn't take anything. I didn't, Jeff. Don't you believe me?" And later, although he tells her, "You're like a leaf that the wind blows from one gutter to another," he is attracted to her, lured as men sometimes are to what they know is wrong and dangerous. Film noir is known for its wise-guy dialogue, but the screenplay for "Out of the Past" reads like an anthology of one-liners. It was based on the 1946 novelBuild My Gallows Highby "Geoffrey Homes," a pseudonym for the blacklisted Daniel Mainwaring, and the screenplay credit goes to Mainwaring, reportedly with extra dialogue by James M. Cain. But the critic Jeff Schwager read all versions of the screenplay for a 1990 Film Comment article, and writes me: "Mainwaring's script was not very good, and in one draft featured awful voice-over narration by the deaf-mute. Cain's script was a total rewrite and even worse; it was totally discarded. The great dialogue was actually the work of Frank Fenton, a B-movie writer whose best known credit was John Ford's 'Wings of Eagles.'" Listen to the contempt with which Sterling silences his hired gun, Stephanos: "Smoke a cigarette, Joe." And "Think of a number, Joe." Listen to Joe tell Jeff how he found his gas station: "It's a small world." Jeff: "Yeah. Or a big sign." Kathie saying "I hate him. I'm sorry he didn't die." Jeff: "Give him time." Jeff's friend the cab driver, assigned to tail Meta Carson: "I lost her." Jeff: "She's worth losing." Jeff to Kathie: "Just get out, will you? I have to sleep in this room." Kathie to Jeff: "You're no good, and neither am I. That's why we deserve each other." And in the movie's most famous exchange, Kathie telling him, "I don't want to die." Jeff: "Neither do I, baby, but if I have to, I'm going to die last." The movie's final scene, between the hometown girl Ann and Jimmy, Jeff's hired kid at the gas station, reflects the moral murkiness of the film with its quiet ambiguity. I won't reveal the details, but as Jimmy answers Ann's question, is he telling her what he believes, what he thinks she wants to believe, or what he thinks it will be best for her to believe?